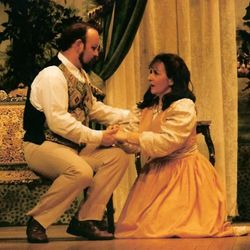 This performance of Verdi's La Traviata was the third production by operahouse with previous ventures being Tosca and Madame Butterfly. Their stated objective has always been to focus on the music and take a minimalist approach to set and props etc. in order that their productions can be taken to almost any venue. 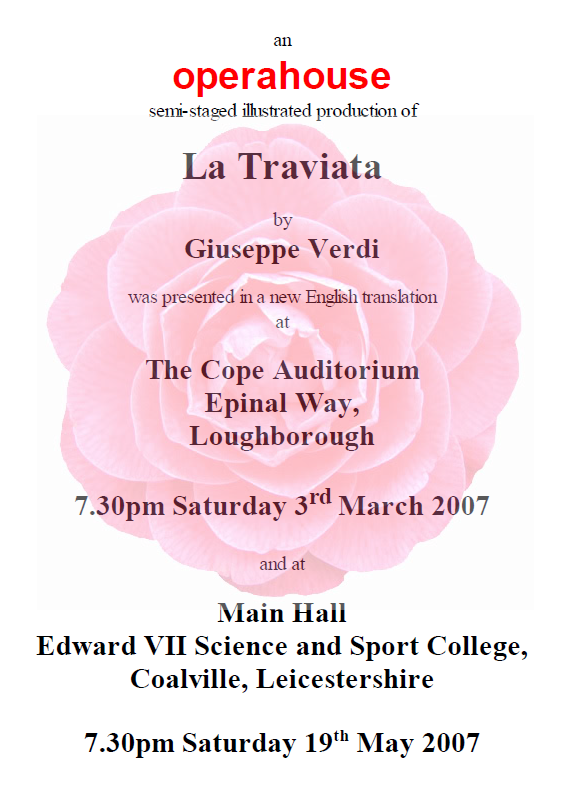 This production marked their debut at the cope Auditorium, having previously performed at the Loughborough Parish Church. Certainly the seats were an improvement and the theatre setting allowed for a very good view, even from several rows back. La Traviata was led by regular performers Clare Proctor (Violetta), Lyndon Gardner (Alfredo) and David Henshaw (Germont), but as we have come to expect from operahouse the whole cast was strong from all angles and worked as a very convincing team particularly in the Act 2 gambling scene and its final ensemble which was probably the highlight of the evening. 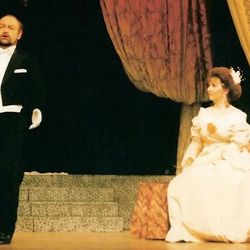 In this production operahouse aimed to emphasise the usually inconsequential minor roles of Flora, the Baron, Gaston and the Doctor and did so splendidly, allowing Kate King, Andrew Lamb, Alan Speight and Paul Blakemore respectively to develop into recognisable characters that played an important part in the opera's drama. While orchestral textures would undoubtedly have accentuated the emotional content of the music, with his deft touch and sympathy with the voices on stage, the remarkable piano accompaniment provided by Anthony Wilson left no one unsatisfied. The three main characters were all clearly conceived and confidently played before a very appreciative audience - it has been good to their following develop. David Henshaw's rich-baritoned Germont was authoritative and yet sympathetic when required. 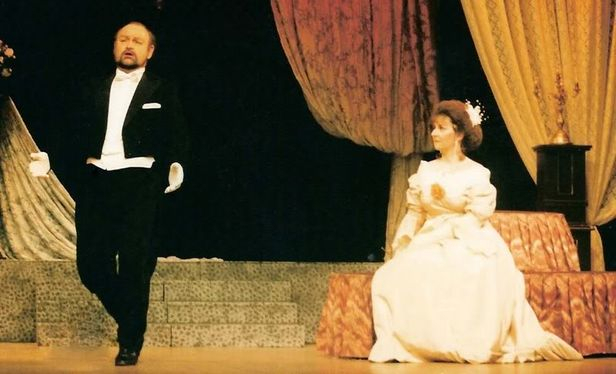 Lyndon Gardner as Alfredo gave a performance full of subtlety and changing tone colours, alternatively aggressive, reflective and especially tender in the Act 3 duet "Nothing My dearest "("Pargi o Cara") with Violetta. But above all this is the vehicle for the soprano and Clare Proctor's clear ringing soprano was equal to the substantial demands of the role of Violetta - the Traviata (the "one led astray". 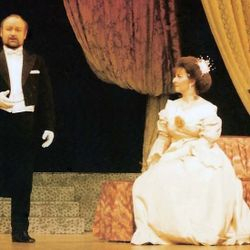 Secure in the demanding aria at the end of Act 1 which required vocal pyrotechnics, she was emotionally broken in the duet in Act 2 with Germont and there was not a dry eye in the house in the final scene at the end of which she died in Alfredo's arms. With the outstanding vocal quality, beautiful costumes and simple but effective scenery, a delightfully rewarding evening of opera was had by all. I look forward to their promised production of Mozart's Magic flute in March 2008.